It was beautiful today. I almost stayed inside because it’s been so cold lately, but when I let Kipp out, it was actually pretty warm! I didn’t even need a sweater; just a long sleeved top. I had been waiting for a nice day to rake the leaves in the yard, so I knew I had to take advantage of the warm weather and sunshine before it went away…for months, ha. At first, I had The Munchkin in the Moby and was doing ok, but eventually he got heavy, so I brought out the exersaucer and put him in that. He played happily and watched me work, and I was amazed at how much faster I was able to work. I don’t know why I was so surprised, but I was. I got the whole front yard raked into piles before he even got fussy! I don’t know if it was because of the length of time he was playing, or the fact that it was getting colder, or the fact that he was tired… but he was a grumpy baby. 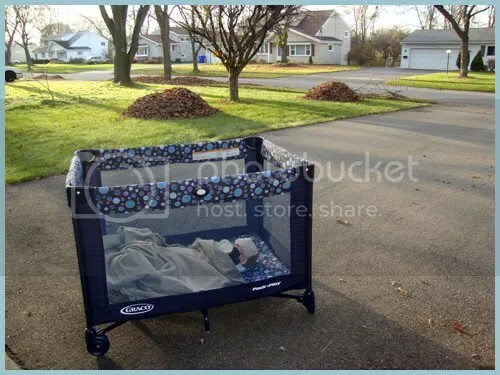 So I picked him up and brought the pack-n-play out into the driveway. I got him a hat, gloves, bottle and a blanket; and he went right to sleep in the sunshine. I finished raking all the front yard leaves to the side of the road just as twilight was about to start. Kipp watched from the back yard and was jealous. Hopefully next weekend will be warm so I can do the back yard. If history tells us anything, it should snow on Thanksgiving, so those leaves have got to GO! Sounds like a GREAT afternoon! !